In Flores, an Indonesian island belonging to the group of the Eastern Lesser Sunda Islands (Nusa Tenggara), and in the nearby Alor Archipelago, the climate is tropical, hot all year round, with a muggy and rainy season from December to March, and a dry season from June to September. In the rainy season, the sun shines for a few hours a day, in fact it usually rains a couple of hours in the morning and a couple of hours in the afternoon. Temperatures are high and quite uniform throughout the year. The least hot period is from June to August. From September to November, and sometimes from mid-August, the hottest period of the year occurs, when the temperature can reach 35/37 °C (95/99 °F), especially on the north side. In the rainy season, on the other hand, high humidity makes the heat muggy. Here are the average temperatures of the most important city, Maumere, located on the northern coast. Throughout the year, 1,600 millimeters (62 inches) of rain fall, with a maximum from December to March and a minimum from June to September. Here is the average precipitation in Maumere. In Flores, there's plenty of sunshine in the dry season, while in the rainy season the sun shines for a few hours a day, between one rain shower and another. In the interior of the island, a blanket of clouds often lies over the mountain peaks. 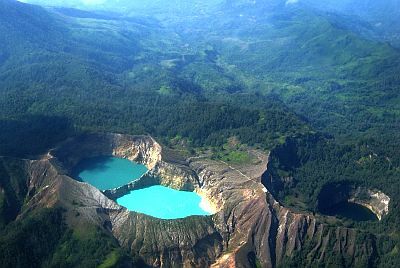 As mentioned, in the interior there are hills and mountains; the highest peak is Poco Mandasawu, 2,370 meters (9,350 feet) high, located in the western part of the island, while in the eastern part we find Kelimutu volcano, 1,639 meters (5,377 ft) high, and characterized by the presence of three lakes that change color. If you are planning some hiking at high altitudes, keep in mind that above 1,000 meters (3,300 feet) it's cool in the evening and at night, especially in the dry season, while above 2,000 meters (6,500 feet) it can get quite cold. Here are the average temperatures of Ruteng, located at 1,100 meters (3,600 feet) above sea level, on the northern slope of Poco Mandasawu. In the mountainous areas, the rains are definitely more abundant: in Ruteng they amount to 3.575 mm (140 in) per year. During the dry season it does not rain much, but sometimes some thunderstorms occur, more often than on the coast. In 2003, in the cave of Liang Bua, north of Ruteng, the fossil remains of hominids lived up to 50,000 years ago have been discovered. The sea in Flores is warm enough to swim in throughout the year: the water temperature ranges from 27 °C (81 °F) in July and August, to 29 °C (84 °F) between November and May. From November to mid-May, but more often from January to mid-April, Flores can be affected by tropical cyclones, which are formed on the sea of Timor, and then move south-westard, between the Sunda Islands and Australia. The best time to travel to Flores and enjoy its beaches, is from June to August: the sun shines, the heat is not too intense, and in any case, it's tempered by the breeze; there are just some short downpours or thunderstorms every now and then. In September, the rains have not started yet, but it starts to get very hot at low altitude. In late September or in October, the rains often increase in inland and mountainous areas.